I am back in Cambridge for a week’s study leave, taking part in the annual summer school organised by the Institute for Orthodox Christian Studies, beginning on Monday [29 August 2016]. The summer school is taking place in Sidney Sussex College once again this year, but before I check into my rooms there tomorrow evening [28 August 2016], two of us are staying in rooms in Clare College today and tomorrow [27 and 28 August 2016]. Our rooms are on Stair Q in Memorial Court, which was built on the other side of the Cam and Queen’s Road, on land that had been bought in the 19th century, and was built after World War I to meet Clare’s need for new buildings with its rapid post-war expansion. The new court was designed by the architect Sir Giles Gilbert Scott as a memorial to all those from Clare who had died in World War I. The monumental memorial arch that forms the entrance to the court is pierced to accommodate a large bell and carries the names of those from Clare who died in both world wars in the 20th century. 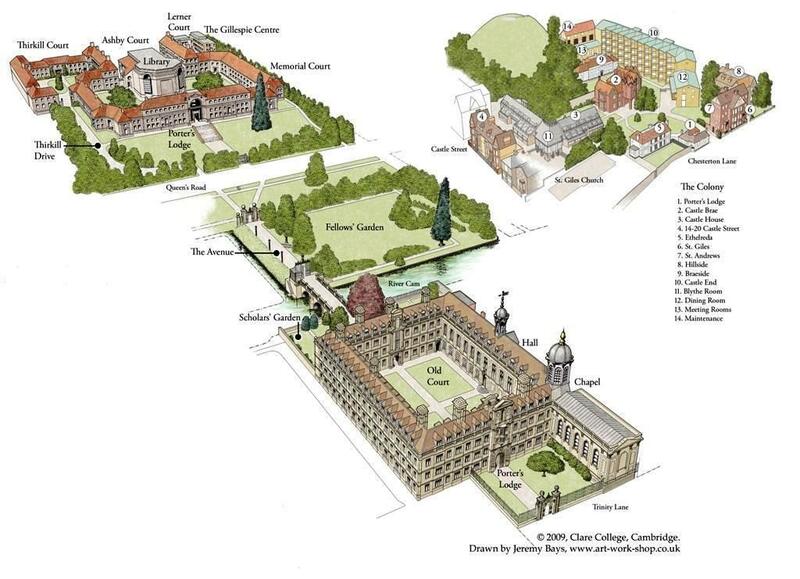 Clare College is the second oldest of the 31 surviving colleges in Cambridge, the oldest being Peterhouse. It was first founded as University Hall by Richard de Badew in 1326. But it was soon in financial difficulties and and was generously re-endowed a few years later by Lady Elizabeth de Clare (Lady de Burgh), a granddaughter of King Edward I (1272-1307). She was the heiress to large estates and tracts of land in Ireland, through her descent from Strongbow and her marriage into the de Burgo family, Earls of Ulster and ancestors of the great Burke families. The black border with tear drops on the college coat-of-arms is a sign of mourning: Lady Elizabeth had three husbands who all died before she was 28. In 1336, King Edward III (1327-1377) granted a licence ‘to his cousin Elizabeth de Burgo’ to establish a collegium that was refounded in 1338. It was known as Clare Hall as early as 1339, but the present simplified title, Clare College, dates only from 1856. The original endowment provided for the maintenance of 15 ‘scholars’ or fellows, of whom no more than six were to be in priestly orders. It also provided for 10 ‘poor scholars’ (paupers or ‘students’), who were to be maintained by the college up to the age of 20. In 1359, a year before her death, Lady Elizabeth de Clare provided a set of statutes for the new college, which have guided the college for almost seven centuries. In the 15th century, the college fought legal battles to remain independent of the jurisdiction of the Bishop of Ely, and this independence was eventually settled in 1430. In 1439, a generous bequest by William Bingham provided for a chaplain and 24 scholars living in what was called ‘God’s House,’ beneath the present Old Schools. In the early 16th century, religious debate in Cambridge was fierce and Hugh Latimer (1485-1555), one of the principal leaders of the English Reformation, was elected a Fellow of Clare in 1510 while still an undergraduate. Despite the turmoils of the Reformation, Clare Hall continued to grow in size and wealth during the 16th century, and the college buildings were soon unable to meet the needs of the growing number of fellows and scholars. The present college buildings that surround the ‘Old Court’ were built over 77 years, from 1638 to 1715. These beautiful buildings look across the lawns of King’s College. Clare tradition says the architect was Inigo Jones, although this tradition cannot be verified. The building programme included the East and South Ranges (1638), the bridge (1639-1640), the North and West Ranges, including the hall (1686-1688), and the Master’s Lodge (1715). The Fellows’ Library was fitted out in its present form before 1738. The chapel dates from a later time (1763). The bridge that links the Fellows’ Garden and Old Court is the oldest bridge now crossing the River Cam in Cambridge, and was the first in the classical style. Thomas Grumbold was paid three shillings for his designs in 1638. The bridge had 14 stone balls, seven on each side. It is said one has a segment missing as Grombold’s supposed revenge for poor payment, his way of ensuring the bridge was never actually completed. In the 18th century, Clare had a number of remarkable fellows. Samuel Blythe was elected to a Fellowship in 1657. He later became Vice-Chancellor of Cambridge University and Master of Clare (1678-1713). After Lady Clare herself, he was Clare’s most generous benefactor and his memory is honoured each year in a college feast that still bears his name. William Whiston (1667-1752) was Isaac Newton’s successor as Lucasian Professor of Mathematics in Cambridge. John Moore, Bishop of Ely (1707-1714), bequeathed his large collection of mediaeval manuscripts to the University Library. The 18th century fellows included the Poet Laureate William Whitehead (1757-1785). But members of Clare in the 18th century also included Charles Townshend, the Chancellor of the Exchequer who imposed taxes on the American colonies that raised the response, ‘No taxation with representation,’ and eventually precipitated the American War of Independence. During the 19th century, the name of the college changed from ‘Clare Hall’ to ‘Clare,’ the college choir was established in 1866, and the college cricket ground, close to Memorial Court on this side of the river, was improved, so that Clare achieved some notable distinctions in cricket. By 1870, the college had 16 fellows and 70 undergraduates. Then in the decades after World War I, the numbers of students grew substantially, so that further accommodation became a necessity. Memorial Court, where I am staying his weekend, was designed by Sir Giles Gilbert Scott in the 1920s and was dedicated in 1926. Sixty years later, in 1986, the Forbes-Mellon library, intended principally for undergraduate use, was built in the large and open court of Memorial Court. Fifty years ago, an endowment from Clare in 1966 led to the foundation of Clare Hall, designed to be a community of scholars, consisting of both official and research fellows as well as a substantial number of visiting fellows. Recent students who graduated from Clare include the composer John Rutter, who read music at Clare, where he was a member of the choir. While he was director of music at Clare (1975-1979), he led the choir to international prominence. In 1972, Clare was one of three Cambridge colleges to admit undergraduate women, a change that had a dramatic effect on the life of Clare College and of Cambridge University. Perhaps it was appropriate that this decision was taken by a college that had been founded by a woman. When I was a student at the Irish School of Ecumenics over 30 years ago (1982-1984), most of the lectures and almost all of the tutorials took place in Bea House, a large, comfortable Edwardian house on Pembroke Park, between Herbert Park and Clyde Road, Ballsbridge. Some of our lectures also took place in Milltown Park, the Jesuit college on Sandford Road, which was only a short walk away, along Marlborough Road or through Donnybrook Village and along Belmont Avenue. Because Pembroke Park was on a corner with Clyde, it was inevitable that the curates of Saint Bartholomew’s Church, Ballsbirdge, also enrolled in the courses at the Irish School of Ecumenics, or that students found placements there. The Revd Ted Ardis was was a curate at Saint Bartholomew’s while he and I were students at ISE, and many ISE students found placements with the then Vicar, the Revd (later Archbishop) John Neill. The ISE house on Pembroke Park was named Bea House after Cardinal Augustin Bea (1881-1968), a German Jesuit and pioneering ecumenist who was the personal confessor of Pope Pius XII. He was a highly influential participant in Vatican II Council in the 1960s and was a decisive force in the drafting of Nostra Aetate, which repudiated anti-Semitism. One recent Sunday morning, during the gap between presiding at the early Said Eucharist in Saint Bartholomew’s and the Choral Eucharist, I strolled along Clyde Road, turned into Pembroke Park, and soon found myself looking for Bea House. I had forgotten it was No 20, and in the past I had usually approached Pembroke Park from the Herbert Park end. I felt the same dislocation I feel when I go looking for houses I had once stayed in or even lived in at some time in the past. But eventually found the former Bea House. Bea House was sold a long time ago by the Irish School of Ecumenics, and since then it has been renamed Ardmore. But I recognised the house and could recall many happy days there with affection and with sentiment. There were hours spent in the library, long and lingering cups of coffee with fellow students, tutorial sessions with the academic staff, who then included Robin Boyd, Alan Falconer and Bill McSweeney, who supervised my dissertation for Trinity College Dublin. After my student days ended in Pembroke Park in the mid-1980s, my associations with the ISE continued as a member of the Academic Council and as editor of ISE’s journal, Unity, and there were meetings with visiting church leaders, including a high-powered group from the Russian Orthodox long before the collapse of the Soviet Union. Pembroke Park is one of the many street names that recall the expansive extent of the Pembroke Estate in this part of Dublin. A whole area of South Dublin around the Grand Canal, Ballsbridge and Sandymount was part of the Pembroke Township, with its own Pembroke Town Hall, and the Pembroke Estate almost coincided with Dublin 4. Soon after leaving school, I spent some years training as a chartered surveyor with Jones Lang Wootton, which managed the Pembroke Estate. The core of the estate was formed by the Fitzwilliam or Merrion estates, which give their names to Fitzwilliam Square, Fitzwilliam Street, Fitzwilliam Place, Fitzwilliam Lane, Fitzwilliam Quay, on the River Dodder at Ringsend, and to Merrion Square, Merrion Street, Merrion Row, Merrion Road, the Merrion Gates, Merrion Strand, Mount Merrion and Mount Merrion Avenue. The Fitzwilliam estate was inherited through marriage by the Herbert family, Earls of Pembroke, and they in turn gave their names to Herbert Park, Herbert Street, Herbert Place, Herbert Avenue and Herbert Road, and to Pembroke Park, Upper and Lower Pembroke Street, Pembroke Lane, Pembroke Row, Pembroke Road, Pembroke Gardens, Pembroke Street in Irishtown, and the numerous Pembroke Cottages throughout South Dublin. The Herbert family estates in Wiltshire also give their name to Wilton Place and Wilton Terrace, while one family member, Sidney Herbert (1853-1813), 14th Earl of Pembroke, gave his name to Sydney Avenue, Sydney Terrace and Sydney Parade Avenue. Family marriages also explain a number of other street names in the area, including Lansdowne Road, Shelbourne Road and Bath Avenue. The Fitzwilliam Museum is one of the main cultural buildings in Cambridge, and so it was interesting to see that Sunday morning that the house next to the former Bea House is called Cambridge. I am spending the next week on study leave in Cambridge, taking part in the annual summer school at Sidney Sussex College organised by the Institute for Orthodox Christian Studies, and so the journey from ISE to Cambridge may circuitous or short, depending on how I look at it, and how I make connections between student days in Dublin and Cambridge that are separated by more than 30 years. One other name on the Pembroke Estate in Dublin also reveals another Cambridge connection. Cherbury Court and Cherbury Gardens, Cherbury Court and Cherbury Mews off Booterstown Avenue in Blackrock stand on the site of a house that was called Herbert House on maps from 1829 to 1842, and Cherbury on later maps. The house was demolished in the 1970s, but its name survives in these street names and recalls the title of Lord Herbert of Cherbury held in the Herbert family from 1624 to 1691, from 1694 to 1734, once more from 1743 to 1801, and again from 1804. The poet, philosopher and diplomat Edward Herbert (1583-1648), 1st Baron Herbert of Cherbury, was the elder brother of the Anglican priest and poet George Herbert (1593-1633), who was educated at Trinity College Cambridge and graduated in 1613. His spirituality is the Anglican Via Media or Middle Way par excellence. His poetry is constantly evident of the intimacy of his dealings with God and his assurance that, alone in a vast universe, he is held safe by the Crucified Christ. On his deathbed, George Herbert sent the manuscript of A Priest to the Temple (or The Country Parson) to his friend, Nicholas Ferrar, who had been a student at Clare College (then Clare Hall), where I am staying tonight. And then my Labour’s not lost.